Thanksgiving is just around the corner. I used to love doing all the cooking for this meal. The kitchen was my comfort zone. I let my family and guests take care of appetizers and desserts while I handled the turkey and sides. Things have changed as some of the “kids” in our clan are now millennials who fancy themselves foodies and are big into the farm-to-table movement. They want to be in the kitchen now. This is actually great because they are turning out some pretty impressive and healthy dishes. They also like playing with my various kitchen technologies, like the George Foreman Grill, the pressure cooker, and the smoker. This Thanksgiving I am going to hand over the kitchen. We may skip some of the traditional sides in favor of healthier, leaner fare. This is where the Foreman Grill is going to come in handy. I have already experimented with a few ideas to try out that will free up some oven space. I really like the Asian sweet potatoes for this recipe. They are similar to russet potatoes with their white flesh, but are higher in nutrients, such as potassium. You can increase the amounts, depending on the size of your holiday party. 1. Heat the GF grill to high. Also, make sure your oven is on. It is likely that it will be during the holiday. 2. Clean the sweet potatoes and remove any eyes or dark brown spots. You don’t need to peel them. Slice into 1/4 inch thick rounds. Place in a bowl and coat with EVOO, salt, and pepper. 3. Cook the slices in batches on the grill with the top closed for approximately 10 minutes. The timing will depend on how much moisture is in the potatoes and how thick they are. After 5 minutes you may want to turn over the slices, as the bottom sides tend to cook faster and darker on the basic grills. 4. Transfer the cooked potatoes to a sheet tray or baking dish. Place in the oven to re-warm before serving your holiday meal. I like to toast nuts for a snack or for chopping and adding to grilled fruit or yogurt. I had never thought to toast them on the Foreman Grill. But, it worked really well. You can always double or triple this recipe and make in batches. 1. Heat the GF grill to high. 2. In a bowl, coat the nuts with the oil and sea salt. 3. Spread the nuts evenly on the grill and close the lid. Check the nuts at 4 minutes. Mine took 5 minutes to get just toasty and crunchy. This makes a really healthy dessert option. It tastes great with the grilled nuts sprinkled on top. 1. Preheat your grill to high. Make sure to have the drip tray in place. 2. In a large bowl, mix the oil, syrup, and cinnamon. 3. Wash the apples. Core them to remove the seeds and stem. Slice the apples into 1/2 inch rounds. Add these to the bowl and toss. Squeeze a little lemon juice over the top and toss again. 4. Grill the apples with the top closed for approximately 10 minutes until they start to soften and get some grill marks on them. They can be served hot or at room temperature with the nuts sprinkled on top and an additional drizzle of maple syrup. I don’t know anyone who doesn’t enjoy Thanksgiving leftovers. With any extra mashed potatoes I will add little all purpose flour and form them into patties. I fry or grill them in butter. These get served with gravy as a sort of breakfast potato pancake. I also like to make patties out of leftover stuffing (or dressing) by binding it with a beaten egg. These get grilled in EVOO for a few minutes until the exterior is crispy. These are like crunchy, savory hand pie snacks. Leftover grilled apples and nuts will get chopped up and served with vanilla yogurt or oatmeal, also for breakfast. 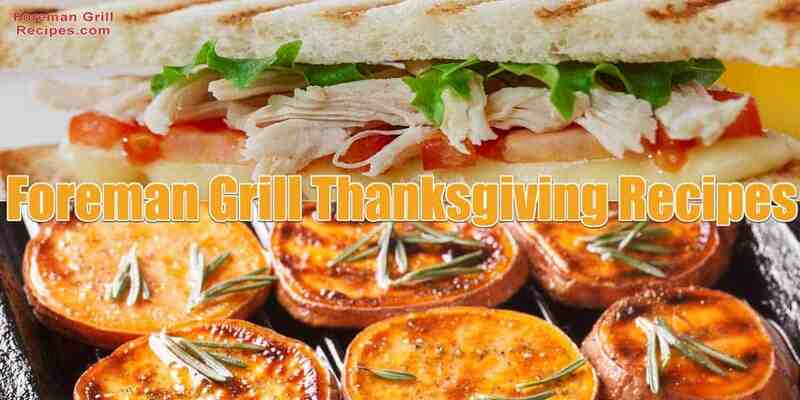 For lunch, we usually have simple grilled turkey sandwiches, like the one below. You can use your Basic Grill or Panini Grill for this recipe. This makes 4 sandwiches. 1. Preheat the grill for about 5 minutes. 2. On a cutting board, lay out 4 pieces of bread. Butter these and flip them over. Spread the unbuttered faces with mustard. Place a slice of cheese on each. Add a piece of ham. Place the sauerkraut or pickles on top of that. Add 2 turkey slices. Season with a little salt and pepper. 3. Butter one side of the other 4 slices of bread. Flip over and spread with mustard. Place these slices of bread, mustard side down, on top of turkey slices. 4. Place the assembled sandwiches on the grill, cheese side down, and close the top. Cook until the cheese has melted and the bread is golden. This will take approximately 3 or 4 minutes. 5. Cut on the diagonal and serve with leftover cranberry relish and some chips.